Even from a sweaty back seat of a low-slung hire car, being driven by two trail mix-loving Swiss chaps, the views driving up the steep valley of Sequoia National Park were beautiful to behold. A six hour drive from Vegas and after some pretty dry scenery, I’m beginning to day-dream about a possible favourite National Park, or pinpoint just one stand-out natural wonder from the many I have been privileged to visit. It’s virtually impossible, and as we continue to scale up the winding road, it’s clear again that I’m edging closer to more of nature’s spectacular structures. The trees are like no others I have ever seen. Magnificently colossal, they’re from a different world. Regal, majestic, massive, old and strangely characterful towers, you travel under them as they look over on the rest of fledgling forest like they are the wise guardians of a nursery of infants. Like wonderfully-magical, wizardly-grandfathers with unfathomable primal powers, it is their forest, and thinking anything else would be like sitting on the side of a live volcano and assuming you control it. Each trunk is an epic display of titanic proportion, suspending belief for a moment as it’s a little difficult to comprehend that these gigantums are real. 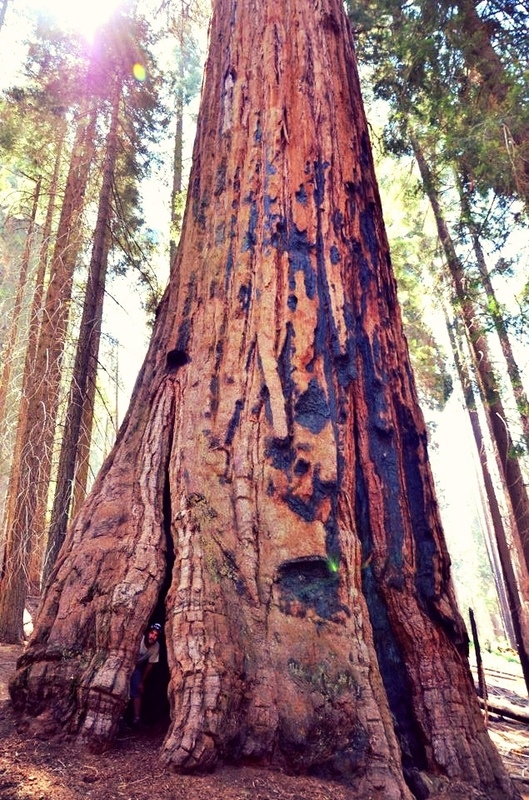 Exploring Sequoia is like walking to through middle earth on the way to Mordor, only with a few less Orks. The “majesty” of the valley and the forever stimulating forest only induces imaginations of storybook critters filling their normally mundane, chore-filled days with miniature adventures and fulfilling explorations. The views are lung-emptying in both the effort it takes to reach them, and the humbled breathlessness that they leave you in. It isn’t hard to see why the famous writer and environmentalist, John Muir made (the now sadly, completely damned and used as a reservoir for San Francisco) Hetechi Valley as his family home. Getting lost in these hills is one of the most memorable, and natural experiences I have had this year. One of the hikes was over twelve miles, across the rocky valley and sun-drenched forest, and (due to the terrain) the longest day walk I have completed within a national park. It is also one of the most tiring (they’re starting to add up) as well as most rewarding. I am glad I have youthful and enthusiastic company. 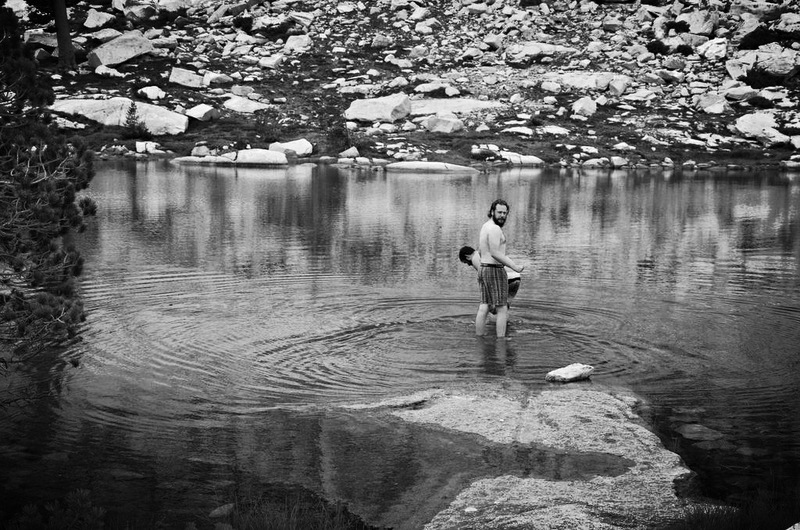 Green tree-lined canyons, boulders, granite cliffs, creeks and lakes all flow around our footsteps as we near this weeks bath time, and swimming in the melt water of Pear Lake at “9000ft” is nothing but freezing. I do however enjoy mocking my mountain-dwelling Swiss friends for finding it much colder than me (probably due to a little weight gained in Texas and Las Vegas). A couple of days sat behind the Swiss: Dani and Urs’s English is rapidly improving. Mainly due to confidence, and that we share a similar sense of humour, we quickly find it easy to negotiate tricky conditions, navigate correctly, share the duties of carrying our back pack, and remember where they parked the car! After gaining some weight, my feet and shoulders are struggling more than usual – and by this time on my trip, it’s not surprising. I have gotten used to many aches and pains; hiking with my pack, nights spent sleeping on couches or floors, having the eating habits of a caterpillar grazing in a blacksmiths, and throwing my body clock around like I’m playing catch with a muzzled dog are really starting to add up. Foot care is (as it always has been) an absolute daily priority, and it’s also nice to finally share an understanding with some fellow hike-lovers. Almost hourly, I feel that I have fire in my shoes. 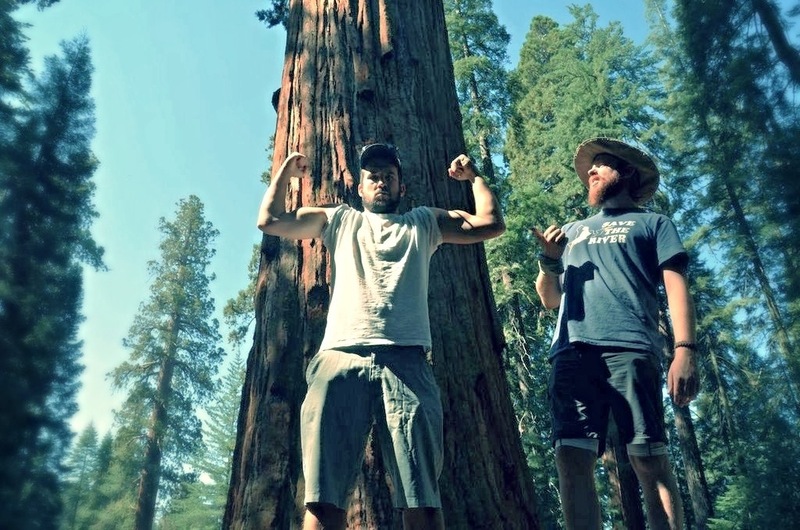 Urs turned 26 while in Sequoia, and to celebrate, we hiked almost 10 miles to see 25 of the largest sequoia trees on earth. Our feet on fire again, and no shower to clean ourselves, Dani and I forgot our worries, and spoilt Urs with the biggest chocolate cake we could find! 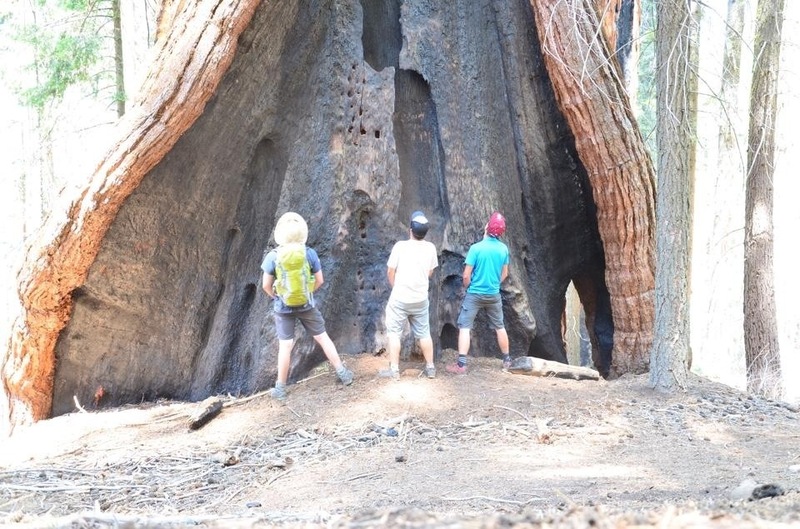 California is proving to be hotter than expected, but at altitude in Sequoia, it is a small oasis away from the rest of the struggling state. We leave the National Park and for the “six” or so hours in the car, driving through the sunshine state it isn’t hard to notice that rural farming towns, the edges of urban sprawl, the abundant hillsides that the car incessantly rolls around, in fact the entire landscape, is dying of thirst. The once green pastures and lush agricultural lands are now brown and grey. Horses and cattle swish their tales to keep cool, and dust flies around them in the dry air. Water sources seem pitiful, crops seem desperate, and any wealth that plant farming may have experienced in this part of the country, seems to be drying up too. I saw the Colorado river in its infancy while travelling through it’s origin in the (Colorado) Rocky Mountains. It is almost 1500-miles long, it supplies water for 30 million people, it is one of the most famous, utilised, built-upon, diverted, damned and controlled rivers on Earth (most notably at the Hoover Dam in Nevada). It faces problems associated with increasing population, declining ecosystems, drought, and climate change. It would normally grow larger as it nears the coast, however it is drained of its flow through multiple American states, and is a baron, empty trickle which has failed to deposit even a sorry offering into the Sea (of Cortez) since the 1960’s. It continues to cause huge controversy, and as California’s main water source, she’s almost dead. Although not without its beauty spots, busy and expensive west coast cities, new-world wine industry, coastal marvels, and its attempts at progressiveness, California seems sadly on its last legs as a fruitful state. Like many areas in the USA, her boom time is over, and many Americans are migrating north into Oregon and elsewhere. Like an ageing Hollywood man’s hairline, the bountiful growth is quickly receding, exposing an expansive desert-forehead. Trapped between a salty coastline, a roasting desert and under the accelerating heat of climate change, California is struggling to age with dignity. As with all things Hollywood, the “forehead” is reported on with much controversy, and unfortunately isn’t looking too sophisticated. Dehydrated and over-furrowed, its hard to find the energy for a young man’s schedule, and being over-worked with a bald patch, in need of a sun hat, California could do with a retirement home. Checking out America’s vast countryside, even the Midwest, is always eye-opening. It’s educational, inspiring, curious to get off the beaten track and intriguing to see how life is, away from tourist hoards. However, as lovely as it is, it’s always more enjoyable to reach a checkpoint. 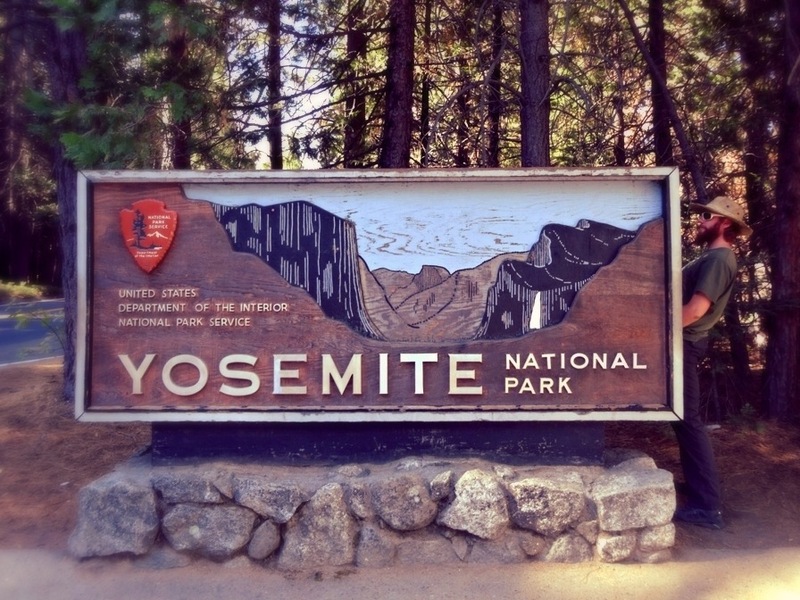 As this is my last before the coast, as well as the second most famous national park in the country; Yosemite evokes possibly the most emotional reaction in me yet – more so for what it means to reach, rather than the spectacle of arriving. I only have one place to go next – the coast! Sadly, my emotions are quickly overcome by reality, and the entrance to Yosemite is more like queuing for a drive through movie, rather than being confronted with the imagined oasis in the hills which might be expected. 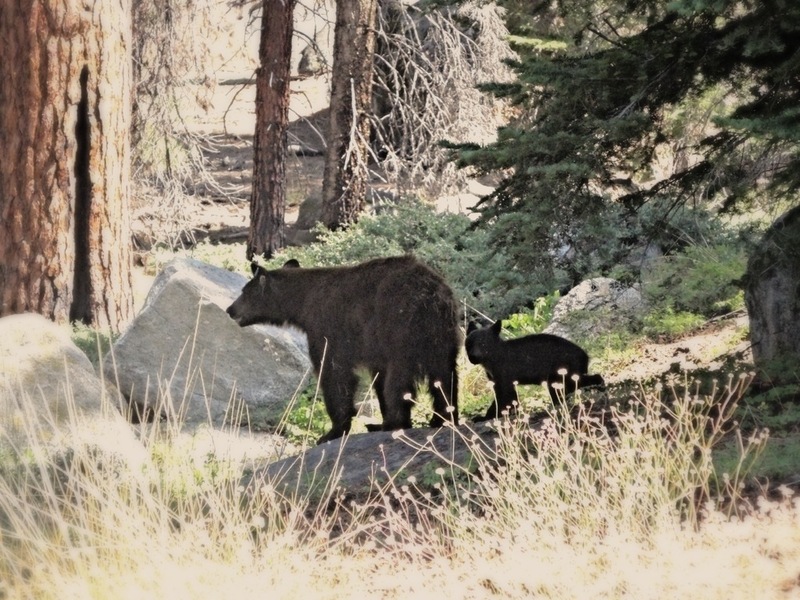 Rather than concentrating on the back of the vehicle in front, or the crowds, or the campsites that are full, or the high number of signs which inform exactly where a bear was killed by a car in recent months, while someone else is driving, its easier to just stare at the trees. 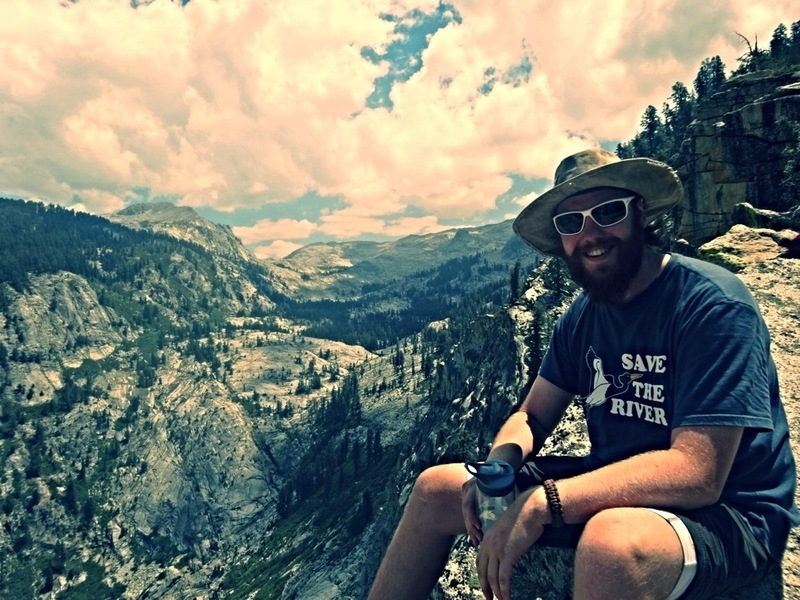 This entry was posted on November 27, 2014 by winstonwolfrider in USA on $6 a day and tagged bear, beard, California, Camping, Charity, Colorado, Couchsurf, desert, feet, hiking, John Muir, Las Vegas, National park, nature, North America, sequoia, USA, Yosemite.